KIEV, Ukraine -- Germany's foreign minister said he would assess the chances of making progress to end the crisis in Ukraine during talks in Moscow on Tuesday but Russia said it saw no chance of a breakthrough. 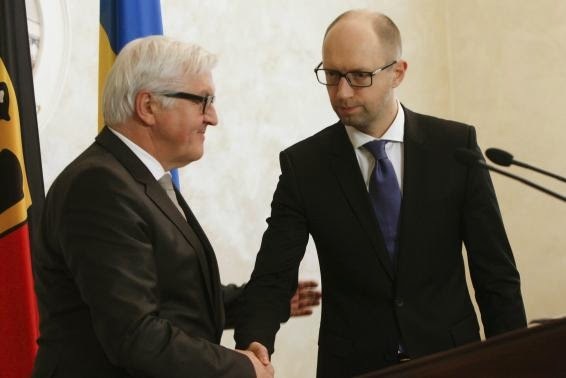 Germany's Foreign Minister Frank-Walter Steinmeier (L) shakes hands with Ukrainian Prime Minister Arseny Yatseniuk during a press briefing in Kiev, November 18, 2014. Foreign Minister Frank-Walter Steinmeier's trip will be one of the first by a senior German official to Moscow since the crisis in Ukraine began, causing a deep rift between Russia and the West. Violence is in the rise again in eastern Ukraine despite a more than two-month-old ceasefire, and Kiev and the West say Russia is sending in soldiers and weapons to help pro-Russian rebels in the east, a charge the Kremlin denies. Speaking in Kiev, where he stopped off on his way to Moscow, Steinmeier said he wanted to see if talks at the weekend in Brisbane between Chancellor Angela Merkel and Vladimir Putin had improved the chances of an effective ceasefire in Ukraine. He told a news conference with Ukrainian Prime Minister Arseny Yatseniuk that he was worried the fighting between government troops and pro-Russian separatists would undermine the ceasefire signed in the Belarussian capital, Minsk. "Last weekend in Brisbane there were a lot of talks with the Russian president including the German chancellor with Mr Putin, so now I am here and this afternoon ... I will set out to see if these talks in Brisbane have created an atmosphere where we can work more concretely to implement the Minsk agreement," he said. "Russia should do what it signed up to and promised the whole world it would do." Russian Foreign Minister Sergei Lavrov played down the likelihood of Steinmeier's trip having any real impact on Russian policy towards Ukraine. "The visit is a working one. We have agreed of course to talk about Ukraine, about our bilateral relations (but) no-one is expecting any breakthrough," Lavrov told a news conference in Minsk. More than 4,100 people have been killed since the separatist rebellions erupted in eastern Ukraine in April. Kiev said six Ukrainian soldiers had been killed in the past 24 hours, bringing to more than 140 the number of government troops killed since the ceasefire was declared on Sept. 5. Lavrov said Moscow would not "plead" with Western powers to lift sanctions imposed over its policies on Ukraine. "We do not seek confrontation in relations with the EU but we will let our European partners know that sanctions are a road to nowhere," he said in Minsk.